Hua Yang Bhd has marked its entry into Penang’s property market with its maiden residential project, Meritus Residensi, located at Jalan Baru, Seberang Perai, Penang. In a press release following an event to introduce Meritus Residensi held in Seberang Perai today, the developer said the 4.32-acre project will consist of 480 units of serviced apartments and 15 retail units with an estimated gross development value (GDV) of RM220 million. The serviced apartment units have built-up areas from 945 sq ft and are priced from RM364,500. Meritus Residensi is expected to be completed by 2020. The project is the first phase of a 6.98-acre freehold mixed development with an estimated GDV of RM324 million, which Hua Yang is developing along Jalan Baru. 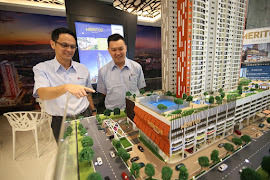 Meritus Residensi is set within a 44-storey tower which Hua Yang said will be an iconic structure in Seberang Perai. “Leveraging on our experience in the property sector that spans close to four decades, coupled with our expertise in delivering innovative, quality and affordable homes, we are confident that our expansion into the Penang property market will augur well for the group,” said Hua Yang chief executive officer Ho Wen Yan. He added that the demand for affordable homes will continue to rise, especially in Penang as the state is developing rapidly and land is scarce in urban areas. “We believe that offerings like Meritus Residensi, which is strategically located and features facilities that cater to contemporary urban lifestyles, will be well-received by first-time homebuyers as well as those who are looking to upgrade,” added Ho.